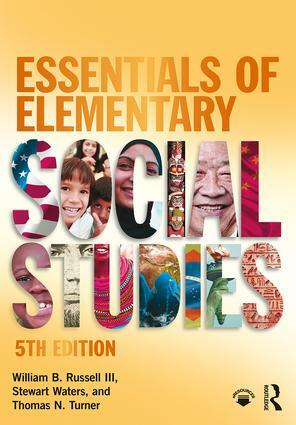 Essentials of Elementary Social Studies is a teacher-friendly text that provides comprehensive treatment of classroom planning, instruction, and strategies. Praised for its dynamic approaches and a writing style that is conversational, personal, and professional, this text enables and encourages teachers to effectively teach elementary social studies using creative and active learning strategies. with new classroom-tested lesson plans and includes two classroom-tested lessons for each grade level (K–6). • An expanded chapter on planning. This provides additional discussion about long-range planning and includes examples of lesson plans with details to help students be better prepared. • An updated chapter on technology designed to better prepare elementary teachers to effectively incorporate technology into social studies instruction. Attention is given to digital history, media literacy, teaching with film and music, popular apps and numerous other types of impactful technology. topics such as teaching with drama, role play, field trips, and service learning. • A new eResource containing links to helpful websites and suggestions for further reading. William B. Russell III is Professor of Social Science Education at The University of Central Florida, Orlando. He teaches social studies related courses and serves as the Social Science Education Ph.D. coordinator. Dr. Russell serves as the Director for The International Society for the Social Studies and is the Editor-in-Chief of the preeminent journal in the field of social studies education, The Journal of Social Studies Research. His research interests include alternative methods for teaching social studies, pre-service teacher education, and teaching with film. Dr. Russell has published numerous books and peer-reviewed journal articles related to social studies education. Stewart Waters is Associate Professor of Social Science Education in the Department of Theory and Practice in Teacher Education at the University of Tennessee, Knoxville. His research interests include alternative methods for teaching social studies, character education, visual literacy, social studies curriculum, and teaching with film. Dr. Waters is the Conference Coordinator for The International Society for the Social Studies and is the Associate Editor for The Journal of Social Studies Research. Dr. Waters has authored numerous books and peer-reviewed journal articles related to social studies education. Thomas N. Turner is Professor of Social Science Education in the Department of Theory and Practice in Teacher Education at the University of Tennessee, Knoxville. His research interests include teaching elementary social studies, social studies methods, and drama in the classroom. He received his BS in Elementary Education from the University of Cincinnati and his master’s and doctorate in Social Science Education at Pennsylvania State University. He is the author of numerous books and over a hundred book chapters and journal articles.